Not only is the Sprout Kids Play Kitchen utterly adorable and eco-friendly, it’s also one of the most affordable play kitchen sets we’ve come across. The Sprout Kids Play Kitchen allows your child to whip up organic pretend food in the oven or microwave, wash play dishes in the sink or chop play produce on the counter. There’s lots of built in storage so you can stock up on play pots, pans and loads of play edibles. Made in the USA with U.S. sourced recycled pre & post consumer recycled materials and featuring cute engraved accents, this play kitchen is safe for kids and easy for parents to construct, featuring simple zero-tool assembly and a flat-pack quality that allows you to store the kitchen under a bed or tucked in a closet when not in use. Like all Sprout products, this play kitchen arrives in 100% recyclable packaging and at just $135 a pop, you’d be hard-pressed to find a better play kitchen deal. Not only is the Sprout Kids Play Kitchen utterly adorable and eco-friendly, it's also one of the most affordable play kitchen sets we've come across. The Sprout Kids Play Kitchen allows your child to whip up organic pretend food in the oven or microwave, wash play dishes in the sink or chop play produce on the counter. There's lots of built in storage so you can stock up on play pots, pans and loads of play edibles. 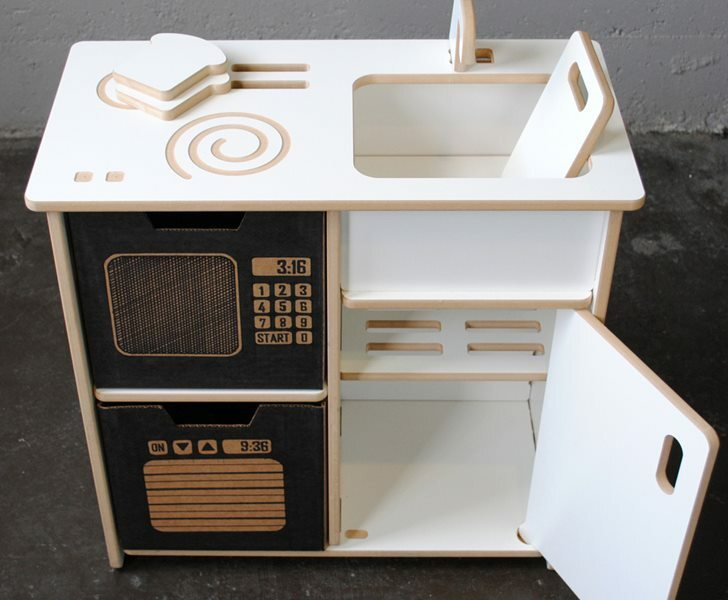 Made in the USA with U.S. sourced�recycled pre & post consumer recycled materials and featuring cute engraved accents, this play kitchen is safe for kids and easy for parents to construct, featuring simple zero-tool assembly and a flat-pack quality that allows you to store the kitchen under a bed or tucked in a closet when not in use. Like all Sprout products, this play kitchen arrives in 100% recyclable packaging and at just $135 a pop, you'd be hard-pressed to find a better play kitchen deal.